This story is part of our month-long “Work Well” initiative, which focuses on thriving in the workplace -- staying healthy and free of anxiety even in the midst of difficult work conditions. The series presents creative solutions you can use to take care of yourself as you take care of business. You can find more stories from this project here. The way we work doesn’t really seem to be working. 13 percent of employees worldwide feelengaged in their occupation. Glimmers of hope, however, are beginning to emerge in this bruising environment: Americans are becoming aware of the toll their jobs take on them, and employers are exploring ways to mitigate the harmful effects of stress and overwork. Yet much more work remains to be done. The modern work world is a “broken and antiquated system,” according to Anne-Marie Slaughter, author of Unfinished Business: Men Women Work Family. Dr. Emma Seppälä, scientific director of Stanford’s Center for Compassion and Altruism Research and Education and author of The Happiness Track, agreed. To call stress an epidemic isn’t hyperbole. The 83 percent of American employees who are stressed about their jobs -- up from 73 percent just a year before -- say that poor compensation and an unreasonable workload are their number-one sources of stress. A 2014 study from the University of Montreal and Concordia University also found that workplace stressors including demanding bosses, unrealistic deadlines, long hours and low pay are contributing to rampant stress and burnout. And if you suspected that the workplace had gotten more stressful than it was just a few decades ago, you're right. Stress levels increased 18 percent for women and 24 percent for men from 1983 to 2009, according to Carnegie Mellon data. Stress is also starting earlier in life, with some data suggesting that today's teens are even more stressed than adults. And the anxiety levels of the average high schooler today are as high as that of the average psychiatric patient in the early 1950’s, according to another estimate. Stress is taking a significant toll on our health, and the collective public health cost may be enormous. Occupational stress increases the risk of heart attack and diabetes, accelerates the aging process, decreases longevity, and contributes to depression and anxiety, among myriad other negative health outcomes. Overall, stress-related health problems account for up to 90 percent of hospital visits, many of them preventable. Your job is “literally killing you,” as the Washington Post put it. It's also hurting our relationships. Working parents say they feel stressed, tired, rushed and short on quality time with their children, friends and partners, according to a new Pew Research Center survey. The boundaries are so blurred that work and life have become one in the same." Seven in 10 workers say they struggle to maintain work-life balance, according to a survey conducted last year. As technology (and with it, work emails) seeps into every aspect of our lives, work-life balance has become an almost meaningless term. “The boundaries are so blurred that work and life have become one in the same,” Seppälä told HuffPost. Add a rapidly changing economy and an uncertain future to this 24/7 connectivity, and you’ve got a recipe for overwork, according to Phyllis Moen, a University of Michigan sociologist who studies careers, families and well-being. These factors have converged to create an increasingly untenable situation with many employees overworking to the point of burnout. It’s not only unsustainable for workers, but also for the companies that employ them. Science has shown a clear correlation between high stress levels in workers and absenteeism, reduced productivity, disengagement and high turnover. Too many workplace policies effectively prohibit employees from developing a healthy work-life balance by barring them from taking time off, even when they need it most, such as when they become parents or caretakers, or when they fall ill.
"I think we're at a tipping point in the sense that this is no longer sustainable." The U.S. trails far behind every wealthy nation -- and many developing ones -- that have family-friendly work policies including paid parental leave, paid sick days and breast-feeding support, according to a 2007 study from researchers at Harvard and McGill University. The U.S. is also the only advanced economy that does not guarantee workers paid vacation time, and it's one of only two countries in the world that does not offer guaranteed paid maternity leave (the other is Papua New Guinea). But even when employees are given paid time off, workplace norms and expectations that pressure them to overwork often prevent them from taking it. Full-time employees who do have paid vacation days only use half of them on average, according to a 2014 survey from Harris Interactive. Karen Firestone, CEO of Boston-based finance firm Aureus Asset Management, recently documented a bizarre phenomenon in her office. She noticed that employees were slipping away for “stealth vacations.” Reluctant to take any time off, when people did take off for a day or two off, they would keep it quiet and not communicate their schedule with others on the team. Our modern workplaces also operate based on antiquated time constraints. We’ve held on to this workday structure -- but thanks to our digital devices, many employees never really clock out. Today, the average American spends 8.8 hours at work each day, and the the majority of working professionals spend additional hours checking in with work during evenings, weekends and even vacations. The problem isn’t the technology itself, but that the technology is being used to create more flexibility for the employer rather than the employee, according to Moen. In a competitive work environment, employers are able to use technology to demand more from their employees rather than incentivizing workers with flexibility that benefits them. When there are fewer employees, the ones who survive are expected to work harder -- plus, they work harder because they want to show that they shouldnt be laid off." In a study published in the Journal of Occupational Health Psychology last year, psychologists coined the term “workplace telepressure” to describe an employee’s urge to immediately respond to emails and engage in obsessive, ruminating thoughts about returning an email to one's boss, colleagues or clients. The researchers found that telepressure is a major cause of stress at work, which over time contributes to physical and mental burnout. Of the 300 employees who participated in the study, those who experienced high levels of telepressure -- which was largely predicted by their workplace culture and expectations -- were more likely to agree with statements assessing burnout, like "I have no energy for going to work in the morning," and to report feeling fatigued and unfocused. Telepressure was also correlated with sleeping poorly and missing work. Harvard Business School professor Leslie Perlow, author of Sleeping with Your Smartphone, explains that when people feel the pressure to be always “on,” they find ways to accommodate that pressure -- including altering their schedules, work habits and interactions with family and friends. Perlow calls this vicious cycle the “cycle of responsiveness”: Once bosses and colleagues experience an employee’s increased responsiveness, they increase their demands on the employee’s time. And because a failure to accept these increased demands indicates a lack of commitment to one’s work, the employee complies. A study published in the Journal of Management examined the ways that technology changes the traditional temporal structure of work, blurring the boundaries between work and personal life. The researchers found that employees who were more ambitious and cared about their work were more likely to meet these expectations to be "always on" -- and also to experience more work-life conflict. To address skyrocketing employee stress levels, many companies have implemented workplace wellness programs, partnering with health care providers that have created programs to promote employee health and well-being. The Centers for Disease Control and Prevention recently declared that workplace wellness has become a “vital piece of a healthy lifestyle.” Workplace wellness programs were even included in the Affordable Care Act in 2014, which created new incentives for employers to create healthy workplaces and support wellness programs. Corporate wellness programs are “our biggest hope for fixing a national health crisis,” according to Cortney Rowan and Karuna Harishanker, design strategists at Altitude, a Massachusetts-based product innovation firm. Some research does suggest that these programs hold promise. A study of employees at health insurance provider Aetna revealed that the roughly one quarter of those who took in-office yoga and mindfulness classes reported a 28 percent reduction in their stress levels and a 20 percent improvement in sleep quality. These less-stressed workers gained an average of 62 minutes per week of productivity, which the company estimates to be worth $3,000 per employee per year. What we're trying to do is change the conditions of work that are creating the stress." While yoga and meditation are scientifically proven to reduce stress levels, these programs do little to target the root causes of burnout and disengagement. The conditions creating the stress, according to the data, are long hours, unrealistic demands and deadlines, and work-life conflict. Moen and her colleagues may have found the solution. In a 2011 study funded by the National Institutes of Health’s Work Family and Health Network, she investigated the effects of implementing a Results Only Work Environment, or ROWE, on the productivity and well-being of employees at Best Buy’s corporate headquarters in Minnesota. For the study, 325 employees spent six months taking part in ROWE, while a control group of 334 employees continued with their normal workflow. The ROWE participants were allowed to freely determine when, where and how they worked -- the only thing that mattered was that they got the job done. The employees could decide if they wanted to work from home, start the day at 11 a.m., miss meetings (so long as a team member covered for them), or make any other personal accommodations as they saw fit. The results were striking. After six months, the employees who participated in ROWE reported reduced work-family conflict and a better sense of control of their time, and they were getting a full hour of extra sleep each night. The employees were less likely to leave their jobs, resulting in reduced turnover. They were even more likely to go see a doctor if they needed to. It’s important to note that the increased flexibility didn’t encourage them to work around the clock. "They didn't work anywhere and all the time -- they were better able to manage their work,” Moen said. Another study, this one focussed on IT workers at a Fortune 500 company, found that when people were given greater control over when and where they worked, they reported experiencing significantly less work-family conflict over a six-month period and said that they felt less overwhelmed at work. People thrive in their jobs and become more fully engaged when they are given autonomy." Seppälä agreed that flexibility can increase productivity and engagement while reducing burnout and work-life conflict. "Research shows that people thrive in their jobs and become more fully engaged when they are given autonomy," she said. "Allowing employees flexibility gives them a sense of autonomy." Slowly but surely, things are beginning to change. Many companies across the country are implementing more family-friendly workplace policies and taking various measures to support employees' work-life balance. 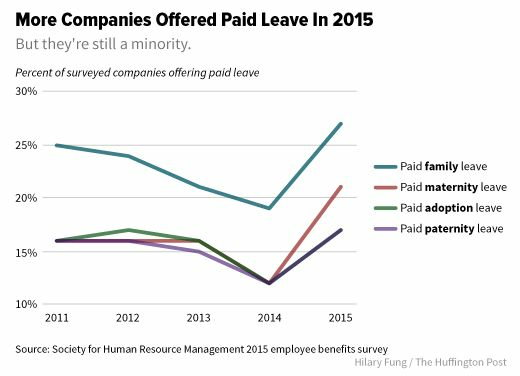 We may look back on 2015 as something of a tipping point for parental leave in the U.S. More and more corporations -- particularly in the tech world -- began upping their parental leave companies, in turn putting pressure on their competitors to do the same. Companies including Netflix, Microsoft, Facebook, Amazon and Goldman Sachs led the charge. Even the City of New York stepped up, announcing last month that it would double the length of paid parental leave (to a total of six weeks) for some 22,000 of its employees. Many companies are offering improved flexible family leave programs, according to a recent report from Lean In and McKinsey & Co. Unfortunately, more than 90 percent of male and female employees said they were reluctant to take advantage of these programs for fear of hurting their careers. This sad statistic highlights the fact that creating new policies simply isn’t enough. If policy changes aren’t supported by cultural shifts, employees won’t feel comfortable following the new policies -- so for any real change to take place, leaders and managers have to model these new behavioral norms. Slowly, corporate cultures can be changed. Moen is optimistic about our ability to use technology to fix the biggest obstacles to employee well-being. In the meantime, regardless of what your employer has to offer, there are some measures that anyone can take to improve their wellness at work. Click here to learn more.